Here are my notes for tunneling a samba share to a local computer between two locations. The server site is running a Debian Linux server with openssh. This server acts as a firewall running iptables. There is another host inside of the server site which is running Samba and serving shares to Windows hosts within that network. I needed to get access to the share so I could continue to work on a book. The client machine I’m writing on is running Windows XP and I’m using PuTTY to access the remote/server site. Essentially, getting access to the share involves adding a Microsoft Loopback Adapter to the local Windows XP client machine, giving that a real IP, one that’s really in my subnet, and then port forwarding through Putty, with a source port of that IP (172.16.0.30:139 for my case) to the remote host port 139. The Microsoft Loopback Adapter is added through Control Panel, Add Hardware. This worked quite well until I rebooted (for other reasons (Windows Update, if you must know)). When I rebooted it seemed that the Microsoft Loopback Adapter got NetBIOS services bound to it. In order to correct this problem, I went into the properties of the Microsoft Loopback Adapter network connection and unchecked the Client for Microsoft Networks, and the File and Printer Sharing checkboxes. Then I could connect again. This entry was posted in Useful Items That I Forget on September 12, 2008 by steve. 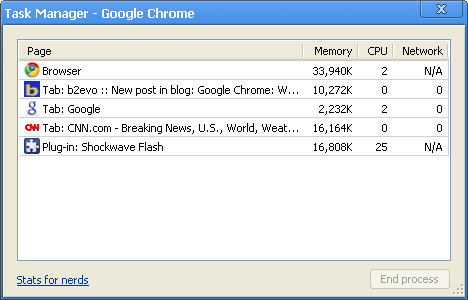 If you’re reading this, then it means that Google’s Chrome Browser is capable of posting into my blog. Actually, there’s no real surprise there, I’ve been using Google Chrome for a while and haven’t been able to get it to break yet. So far I like the look and feel, not to mention that it definitely feels quicker than Firefox, especially Firefox 3. Chrome just makes it feel like I’m using an application, rather than a web browser with a web page or application inside. In many ways, Google Chrome feels like what a browser should be in 2008/2009: The same features pioneered by Firefox and taken for granted today like tabs and pop-up blocking but with a faster and lighter interface taking into account a more technical audience who doesn’t need all of the visual aids that anchor other browsers. I use a custom portal solution so I don’t think I’ll get much use out of the homepage/frequently-visited sites feature when opening but I can see how that would be a time saver. I’m hoping that the silly user-agent detection things on web sites won’t break when visiting. 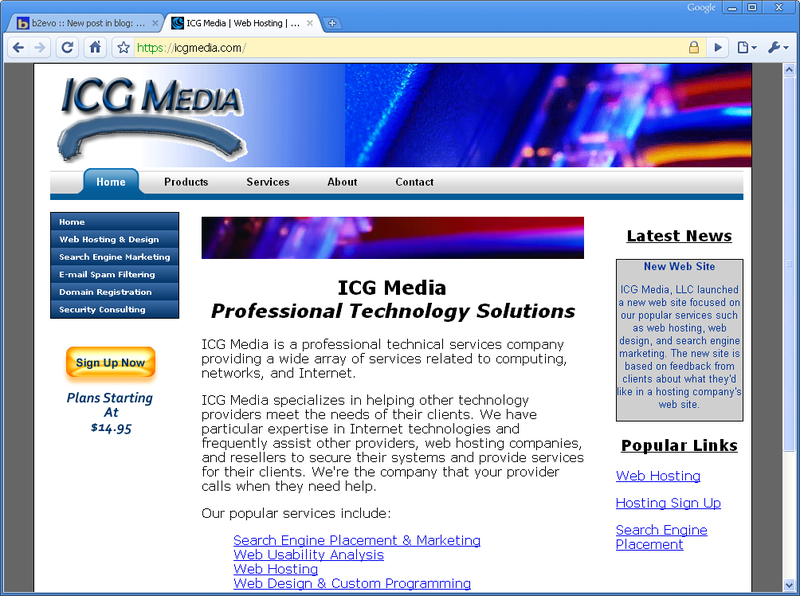 Here’s a screenshot of Chrome in action, with a couple tabs open, one to this post being written and the other to the web hosting company ICG Media. I’m also hoping for extensions which means a good dev kit and documented API. Specifically, an adblocker and something like Firebug are necessary. I look forward to working with Chrome, both as a user and developer. This entry was posted in Current Projects on September 2, 2008 by steve. Less than 60 seconds after I posted that initial blog posting about Google Chrome, hoping for a Firebug-like extension, I found the “Inspect Element” action on the right-click menu in Google Chrome. Oops. 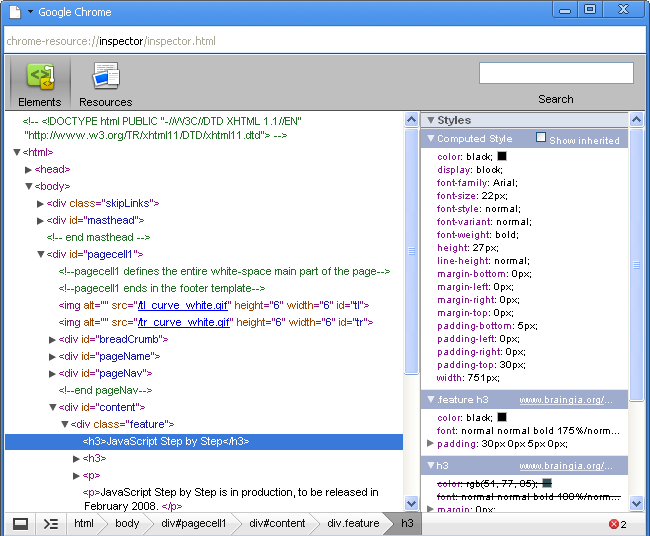 The Inspect Element option essentially *is* Firebug, built right into the browser! No need to download an extension, see the screenshot here. 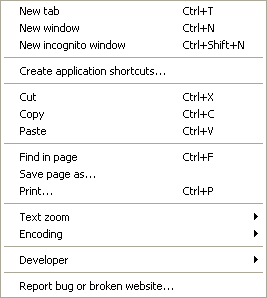 There are several other developer tools all found on the “Page” menu, shown here.